The Expert Manifesto was designed by Geoff McDonald. He is the creator of 1000Manifestos.com. Also, the author of The Manifesto Manifesto. 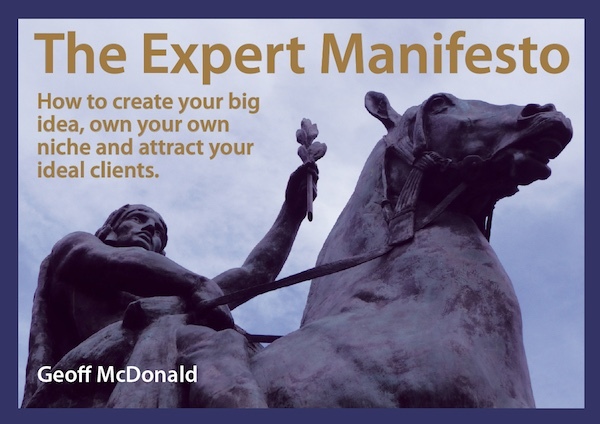 The Expert Manifesto outlines the seven ideals of being a business expert. These ideals are for building a profitable global business around your expertise. Own Your Own Niche: it’s not enough to claim a niche, it’s crucial to own one that you have created. Attract Your Ideal Clients: why work with just anyone? If you set the goal of having ideal clients you can build a business that serves only them. This is likely to be more profitable and enjoyable. Unite with a Double Sided Vision: Most mission and vision statements are selfish – they’re all about you and don’t include your clients. Share a Philosophy to Buy into: Your ideal clients are not buying a mere product or service. To build lifetime loyalty you want them to buy into your philosophy for life, business or success. Build an Idea that Scales: An expert is an expert because of the things they know and the ideas they create. If your idea doesn’t scale then you severely limit your chances of building a profitable global business. Play a Game Worth Winning: It must be a game that you and your clients want to win. Write the Rules for Success: When you write the rules for success then you become the expert in the game. This is a simple 7-part rule based manifesto for speakers, trainers, coaches, thought leaders, consultants and an internal expert within an organisation. What do you mean by ‘a Double Sided Vision’? This is an important aspect of creating a manifesto that provokes interest and curiosity. With the ebook it’s a good example of how a simple manifesto can become a scalable idea. As a manifesto it is a simple 7 line document that could fit neatly on a postcard or a social media image. The ebook shows that once you can easily expand the manifesto into products and services.